FOUR DUBLIN tennis players have been formally entered into the Guinness book of world records for an astonishingly overlength men’s doubles match, which they completed for charity at the Fitzwilliam Tennis Club during the summer of last year. 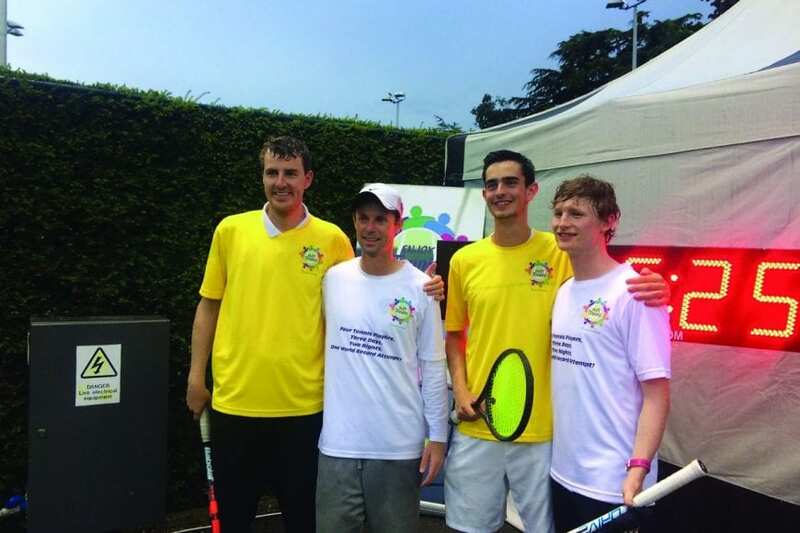 The game, which lasted 60 hours, 24 minutes and 19 seconds, finished with a scoreline of 73 games to 70, and raised five figures in sponsorship for Enjoy Tennis, a charity aiming to give access to the sport to disabled players. The teams were made up of former Irish Davis Cup men James Cluskey – from Swords – and David Mullins, and Trinity tennis club players Luke Maguire and Dan O’Neill. The players allowed five minutes of time off the court for every hour they played, and had their match verified by two independent observers from the Guinness book. The players saved this time, and took a 40 minute break in a block every eight hours, to nap and eat. The game started on the 13 July, and concluded on the 15, taking in periods of heat and of rain. “It makes me very proud to be a part of this world record. There were four guys on the court but it was a huge team effort. “I’m so proud of the Irish tennis community for all their support,” former pro international Cluskey said of the record. “We were struggling Sunday morning but we had people to keep us going and push us through. It was heartening on Sunday evening when we were about to finish in the pouring rain and yet there was still lots of people cheering us on. O’Neill added “I can’t believe I played for 60 hours with virtually no sleep. “Even at my lowest point from 12am to 4am on Sunday morning when I was physically at rock bottom, all I was thinking about was hanging in there. The range of disabilities covered by the Enjoy Tennis programme includes intellectual disability, autism, blind and visual impairment, cerebral palsy, acquired brain injury and wheelchair users. The funds raised will also allow the group to bring Enjoy Tennis to those providing services to people experiencing mental health issues. The charity currently has over 1,000 players involved spread across 70 different tennis clubs.